A journalist in Nicaragua has been shot dead while doing a live broadcast about anti-government protests. Ángel Gahona was reporting on damage at a bank in the Caribbean coast town of Bluefields when a bullet hit him during his Facebook Live newscast. Video footage shows him falling to the ground and bleeding. 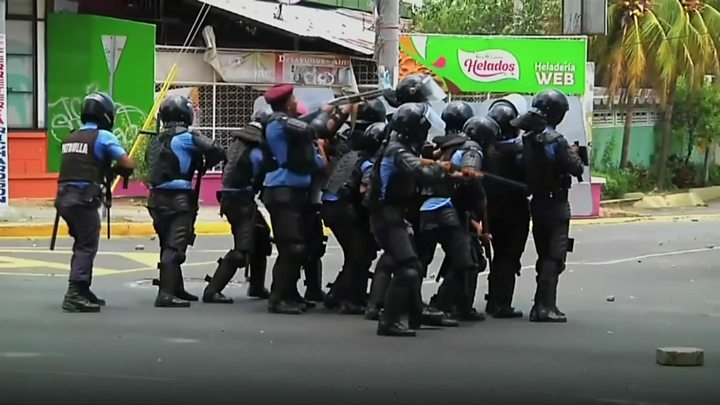 More than 10 people have died in days of protests against pension changes approved by the government of President Daniel Ortega on Wednesday. The move increased pension contributions for workers and employers and reduced overall benefits by 5%. Mr Ortega has offered talks but protest leaders have refused, saying police violence must stop first. Government buildings have been damaged or set on fire, and troops have been deployed in several cities. Students from Polytechnic University in Managua have barricaded their campus. At least 100 people have been injured. Pope Francis has called for an end to the violence and for differences to "be resolved peacefully and with a sense of responsibility." One human rights group reported that the death toll was more than 25. In Friday's incident in Bluefields, the footage shows Mr Gahona describing a damaged cash machine before a shot rings out. He is then seen slumping to the ground, as people scream his name and try to help. It is unclear who shot him or why. 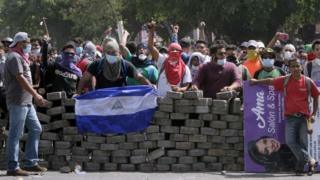 The protests are the biggest challenge to Mr Ortega's authority since he took office in 2007. He has said the new measures will not go into effect until 1 July, which gives the government and the private sector time to negotiate. The government seemed to have the situation under control on Saturday, with deployment of army troops across the country. Protesters blamed riot police and government supporters for the violence. The human rights group Amnesty International said the authorities had been carrying out a "terrifying clampdown on dissent".